There’s been a lot of ink spilled lately putting quant investing, factor investing, screening, ranking, etc. on the defensive. On January 22, 2019, I responded to a Bloomberg post criticizing quants. More recently, on March 2, Forbes Senior Contributor William Baldwin challenged the efficacy of screening and suggested that you should put the bulk of your money into index funds and use screening only to “entertain yourself” but that with the latter, you should “not expect to beat the market.” It’s time for someone to give the other side of the story, what screening, etc. can accomplish. I’d say “Screening” is my middle name, but my parents left it off the birth certificate and I never got around to filing papers to change it. But you get the idea. You can find my professional bio here. I believe my use of screening (and the closely-related discipline of ranking) justifies me in calling myself a quant, a factor-oriented investor. But I don’t work the way most quants do, in a conventional Fama-French way. As with the latter and the many inspired by their work, I sort a group of stocks and select the top “ranked” names, but my approach to factor selection is more pragmatic and fundamental than empirical and academic. Also unlike traditional factor investing which works with the broadest samples, I believe use of screening to pre-qualify stocks that will be ranked, analogous to the way sales calls limited to those on a purchased list of pre-qualified prospects is superior to cold calling from a telephone directory. Screening is absolutely positively the best way to find stock investment ideas. We’ll explore why this is so in Chapter 4, but for now, suffice it to say no other approach can match screening when it comes to calling stocks to your attention based on at least some objective showing of merit and without regard to what periodicals you read, what finance broadcasts you see or hear, what analysts you encounter, what tips your friends provide, or where you live, work or shop. And having the right stocks come to your attention is a major determinant of investment performance. No matter how great you are at deciphering financial statements, understanding business dynamics, or reading stock price charts, you have no real chance to achieve investment success if you always wind up applying your skills to stocks that aren’t really worthy of being looked at in the first place. OK, so screening is the best way to pick stocks. 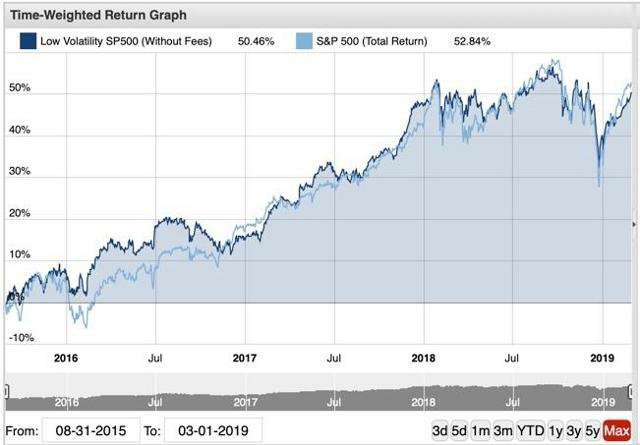 But that leaves open the question of why bother trying to pick stocks at all, when it’s so easy to index nowadays by purchasing and holding the S&P 500 SPDR ETF (SPY), or some other index-based ETF. Fist off, there’s nothing wrong with indexing if one has an “affirmative” reason for doing so, such as an asset allocation choice to take exposure to an overall asset class. My problem with indexing is with those who do or advocate it for negative reasons; i.e. saying it’s impossible to do better because we’re bad at making active choices. Admittedly, not everybody can use screening to beat the S&P 500. Then again, not everybody can write well enough to get published. Not everybody can act, sing or dance well enough to become make a career in the performing arts or even get in front of a room full of people without making a fool of one’s self. Not everybody can cook well enough be a chef, or even outperform take-out junk-food. Not every physician is good enough to avoid losing malpractice cases. Not every realtor can sell enough to make a living. I think you get the point. Now, cue the violins: Does the inability of everybody, or even a majority of people to be good at something mean that nobody should try to do better? Are you listening that Tom Brady? Close the laptop and stop studying video because most quarterbacks can’t hope to do what you can. Seriously? (Actually, Tom, I’m a NY Jets fan so feel free to do me a solid and shut the #&%$ laptop!) How are you consuming this content? Would you be able to do what you’re doing if countless people just threw up their hands and refused to try to be better because the average person is only average? OK, that’s enough; I’m sure you get the idea and am even starting to annoy myself. Mr. Baldwin, in his critique of AAII, claimed only 30 of the of its 59 screens beat the market. I came up with a different answer, probably because I used a different source. I got my numbers from the AAII web site on 3/2/19; anyone with an AAII password can see it (or newer data if you click at a later date) here. I’m guessing that Baldwin used an older data set (he referfed to some sort of comprehensive AAII review and these are usually from one of their magazines, which involve publication time lags). 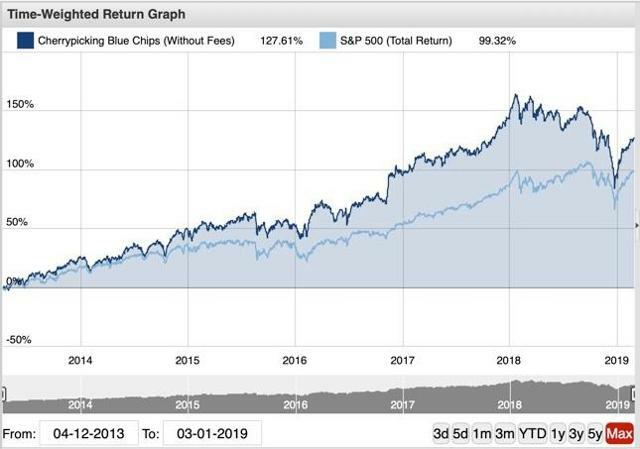 Anyway, I went through the whole web presentation and show, in Table 1, how many out of 59 screens outperformed the S&P 500 each year from 2004 through 2018, year to date 2019, and in the aggregate for the entire period. In the quant community, 2018 will long remembered as an epoch firestorm. There’s no way around it. I stunk it up in 2018. So, too, did pretty much everybody who invests based on data. My above-cited 1/22/19 post will provide a flavor of what was going on. Aside from this recent exceptionally difficult period, Table 1 shows generally strong performance of AAII’s screens. Was Mr. Baldwin doing wrong for using the dataset he used? Am I doing wrong using the dataset I’m using? Answer: None of the above. The challenge, when reviewing investment performance (as opposed to a movie) is that there’s never a clear-cut start date (we can always debate choices) and there is NEVER a clear-cut end date — because there is always tomorrow, next week, next month, next year. So it’s never proper to run one set of numbers and say one has the answer. One must instead run many sets of numbers and using the constellation of all the answers, try one’s best to discern the differences between abnormal and normal occurrences. (Imagine if we stopped tracking after 12/31/2008!) 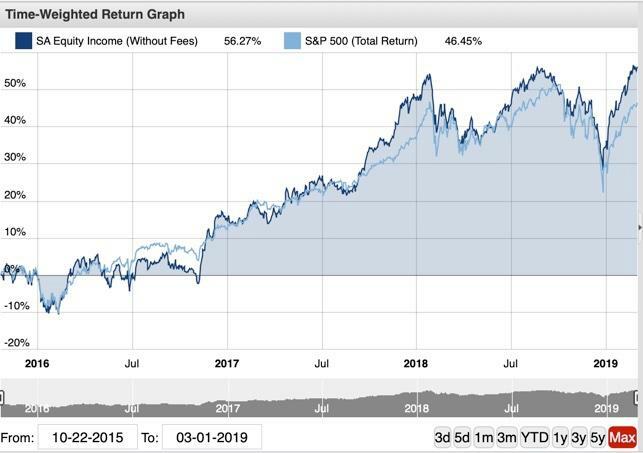 Based on the more comprehensive approach I propose, I’d say AAII and its screens are doing quite well for its members and more often than not, giving them opportunities to beat the S&P 500. In addition to what’s in my bio, note that from mid-2010 through mid-2015 I ran the screening-based Forbes Low Priced Stock Report (LPSR). This newsletter was born in 2010 out of a shared belief held by myself and Forbes’ that stock screening could be a successful way for investors to navigate the often treacherous wild-west-like world of stocks priced at single digit levels, an area regarded by many investors as a guilty pleasure but one filled with too many companies that, to put it politely, were not exactly stars of either the business or financial community. 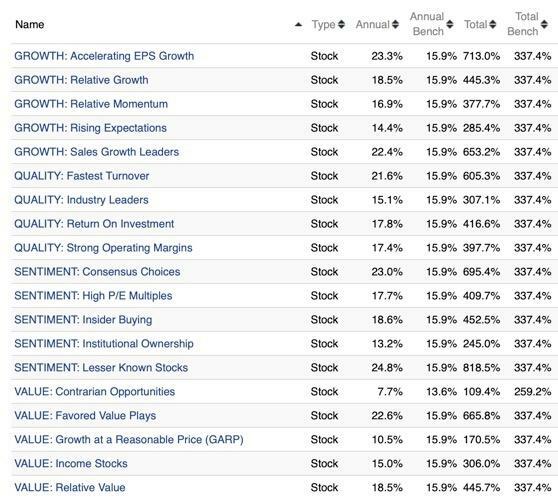 I built a Portfolio123 screen to identify potential candidates and used a Portfolio123 ranking system to identify a Model Portfolio that could consist of the 15 top-ranked stocks from among those that passed the screen. Wishing to offer more variety (and concerned that 15 names be represent too much concentration for such a volatile area of the market) I also presented a list that added the next 25 ranked stocks — I referred to the total (the 40 highest ranked stocks) as the Master List. From among each month’s Master List, I selected some for text write-ups. Needless to say, I tracked results of everything. % Total Return for . . . Although performance was successful and I was happy with the money I made by owning the entire Master List each month (I invested via Folio Investing, where transaction costs posed no obstacle), I decided to end the newsletter in mid-2015 as it became apparent that selling the screen (the screen results) was too darn difficult. Screening requires thought, but media works best with quips and clicks. But I never did vaporize the screen, so just for the heck of it, I checked Portfolio123’s back tester to see how it did from 8/1/15 (the first month of non-publication) through the present. (Although I use the phrase back-test, this is actually out-of-sample since the screen was built in early 2010). % Total Return 8/1/15 – 3/3/19 for . . .
Table 4 shows an interesting comparison of the performance of the stocks written up to these benchmarks over the time period when each recommendation was open and averaged them out over 612 write-ups during the life of the newsletter. Excess of Write-ups over . . . The results are good, but not as good as those achieved by the screen alone. In other words, my own screen outperformed me. And much to the chagrin of my ego, I’ve experienced it many times on occasions where I subjectively tried to pick the best ideas from my screens or cross out what I thought would be duds. Usually, I’d have been better off just leaving the screen alone and going with those. Oh well. At least the human version of me still did OK.
That said, in terms of subscriber dollars and cents, the main value was in the screens (and the willingness of subscribers to set up an account with a firm like Folio, where they could own the whole list without being burdened by commissions). But subscribers most valued the writeups, which produced the least and were a huge drain on my time. That was a shame. I really wish this could have kept going. Sigh . . .
At any rate, I beat the S&P 500 for quite a while. As is the case on other platforms (including, obviously, AAII), Portfolio123 makes pre-built screens available to users, many of which can be used as is and others of which are for educational purposes (examples that can be saved by users in their own accounts and edited by them as they wish). One such group of pre-built offerings is known as Reuters Select. This is a group of screens I originally created in 1999 for the old CD-based screener Market Guide for Windows. I called it Market Guide Select. When Market Guide was acquired by Multex, the screens migrated to that company’s version of the screener and the collection was called Multex Select, and when Multex was acquired by Reuters, it was renamed Reuters Select. I brought the screens with me when I moved to Portfolio123 (by which point, I gave up renaming them). As screening techniques go, they are rather old and creaky. Before Portfolio123, I had no ability to create and build ranking systems (hence the screens were more useful as idea generators than as algorithmic portfolios since they often listed many passing stocks), less sophisticated custom formula capabilities, as well as other deficiencies the most draining of which was no testing capabilities (before I got to Portfolio123, I had to do it manually using old CDs I saved). Figure 1 shows the performance of these screens over the last 10 years. What’s important, though, in todays world characterized as it often is by claims that quants rely too much on extreme backtesting (data mining, curve fitting) and produce models that looked good in the past but fail when used with live money going forward is that these results are very very “out of sample:” The start dates begin about 10 years after the screens were created. In fact, I can’t recall having even looked at them much, if at all, over the past decade. Not all of these screens beat SPY. But enough did to make it clear that screening is not just for entertainment. Figure 2, meanwhile, shows an interesting collection of pre-set screens. These were all built for educational purposes, to demonstrate to Portfolio123 users how to approach different styles. For each style there are four variations; Basic, Market, Industry and Comprehensive. Basic demonstrates what I might call screening for dummies. These are the sort of naive filters that might be used by a non-investor to give a trade-show type demo that does, indeed, treat screening as little more than a toy. The Market screens use factors that compare companies to the investment universe while the Industry screens compare companies to Industry peers. The Comprehensive group are, well, what the label suggests; comprehensive, meaning they make multiple comparisons. And contrary to the old Reuters Select group, these demonstrated invest-ability: The results of all screens were limited to the passing stocks that were ranked in the top 15 as per the Comprehensive: QVG (Quality-Value-Growth) ranking system I built for Portfolio123. Notice how most of the screens beat SPY over the 10 years after they were created. Also, compare the Basic versions to the Comprehensive versions. 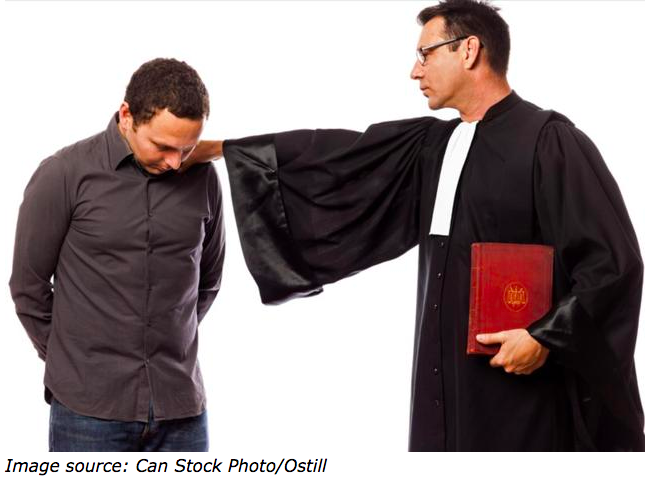 As in most walks of life, grown-up approaches tend to outperform for-dummies methodologies. Finally, like AAII, I created a set of guru-inspired screens (which I combined with guru-inspired ranking systems to limit the number of passing stocks to an investable level). But in an effort to present an original name, I refer to my collection as All-Star Screens. Figure 3 shows how they fared relative to the S&P 500. 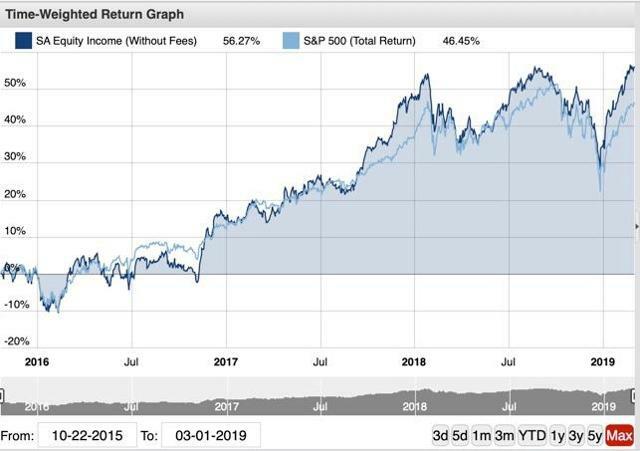 Portfolio123 is in the process of introducing a web site that will contain a new Invest section for free use that includes a variety of investable strategies in stocks, fixed income, and mixed assets. If you sign up — for free — you can access the stock strategies, as well as detailed explanations, by starting here. Table 5 lists the strategies and their respective total returns from their respective launch dates (i.e., the dates as of which each strategy was completed and turned loose, so to speak, for automated updating and monitoring). Yields are 3.34% for Returning Capital to Shareholders (looks at dividends and share repurchases) and 3.89% for Sweet Spot Equity Income versus 3.24% for DVY. The Expecting Dividend Growth strategy is more yield oriented (2.89%) than the more-equity-growth like VIG ETF, which yields 1.87%. The Genuine Value strategy is courtesy of my Portfolio123 colleague Riccardo Tambara. Considering how horribly Value has performed during much of this strategy’s life, the performance record delivered by Tabara’s strategy is nothing short of amazing. But he won’t boast. We all know about the great equalizer — Tomorrow. Built for Stability and Sweet Spot Equity Income are revised versions of two Portfolio123 Designer Models in which I’m invested and which will be presented below. It’ll be interesting to watch the progress of Swinging for the Fences. 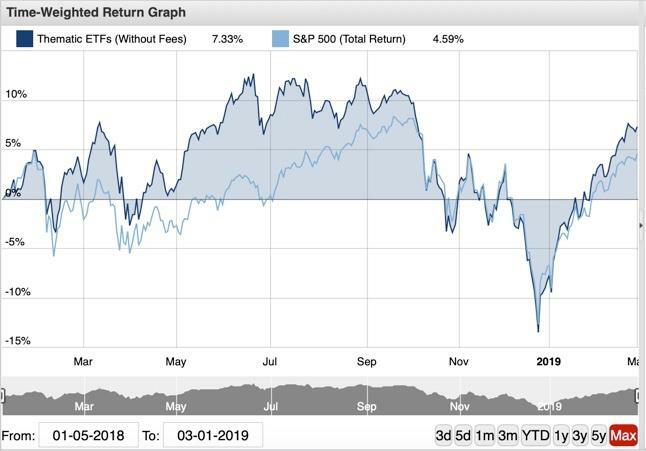 I’m not cut out for pure unadulterated Momentum investing such as what we get from MTUM (the latter having been a major winner in last year’s quant bloodbath). I openly explain, in the strategy’s short description and detailed white paper how and why my version is moderated by considerations of Quality and Value. While it’s off to an inauspicious start, anybody investing in it should be going in with eyes wide open and a full opportunity to decide for themselves whether or not they think the balance I’m trying to achieve will ultimately be doable. Nobody can promise superior performance. But anybody can and should deliver transparency and the ability of a user to make a thoughtful choice, and is something I do here. Figures 4 through 8 are screen shots taken on 3/2/19 from my account at FolioInvesting.com. These show real-word (as real as it can possibly get) results of screen-based models. First off is a model I refer to as “Cherry-picking the Blue Chips,” which has long been available for free on the Portfolio123 Designer Model platform and about which I’ve often written in the past; see, e.g. this 2015 Forbes post. I invested my own money in it as well, and Figure 3 shows my results through 3/2/19. Next up is a Low Volatility S&P 500 Portfolio123 Designer Model in which I also invested. My Forbes post describing it can be seen here. This strategy started well (delivering the decent performance and low volatility I sought) but hasn’t been a star lately. That’s OK. I’m comfortable with the strategy, I know that nothing works all the time, and understand that the last few years were dominated by high-risk high-momentum stocks. I choose to refrain from racing the S&P under conditions like that because I know that sort of story never ends and how badly momentum chasers often wind up after they get too giddy. This is an important point. 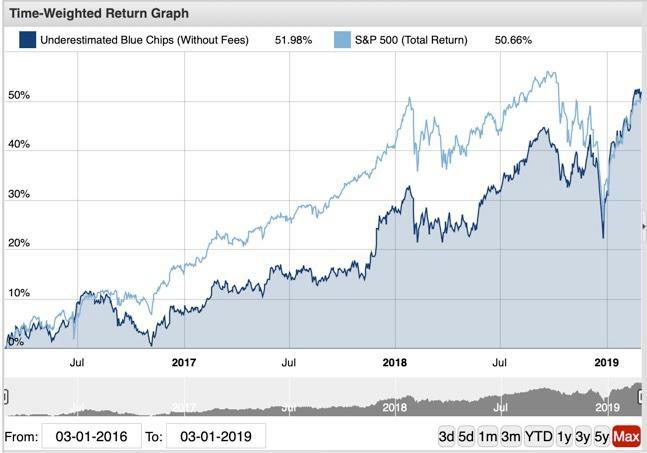 It’s never about a footrace between the investor and the S&P 500. It’s about rational choices that balance potential reward and risk. This is an example of where I think it’s time to tell finger-wagging scorekeepers to take a hike. 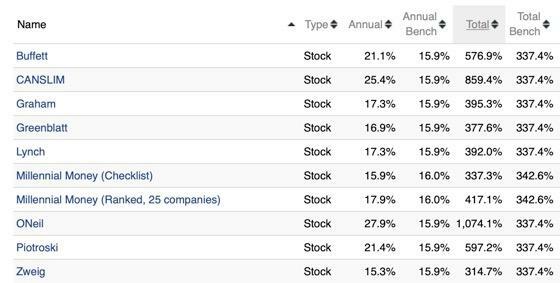 Now let’s look at an equity income strategy, another Portfolio123 DesignerModel in which I invested my own money. Here’s a Forbes post addressing it. 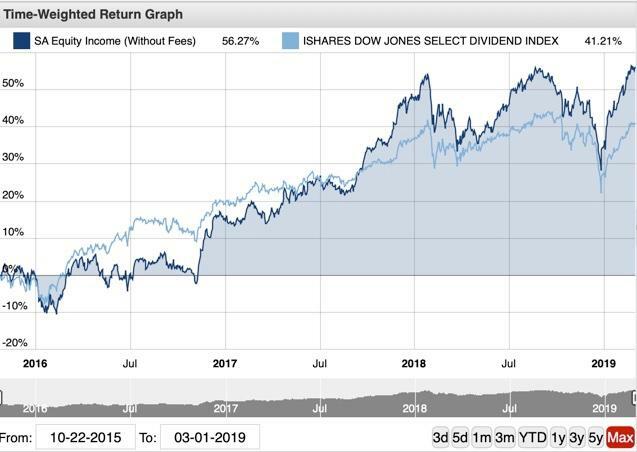 Figures 5 and 6 compare its live-money performance in my account to the S&P 500 and to the iShares Select Dividend ETF (DVY) respectively. By the way, as of this writing, my model yields 3.76%, versus 1.82% and 3.24% for SPY and DVY respectively. Next is one of my oddball Portfolio123 Designer Models, one which I refer to as Underestimated Blue Chips. It’s a value model but uses no value ratios. Instead, I adapt a concept introduced by Robert Shiller and expanded upon by Stanford’s Dr. Charles Lee, and adapted for invest-ability by me to focus on S&P 500 stocks for which a smaller than usual portion of the stock price is accounted for by “noise.” Don’t ask me to explain here; if you’re interested, check out this prior Forbes post. Figure 8, which shows how it’s been performing in my Folio Investing account, is particularly instructive. Talk about starting off in a really rotten way, and then staying the bad course for quite a while. Naturally, as a continuation of basic due diligence, I re-checked the model after its initial pothole to assess whether I still believed in the concept. I answered “yes,” and then did what many gurus advocate. I put it put of my mind and let it do its thing on autopilot, intervening only to upload refreshed ticker lists to Folio Investing once every three months. Then, on 1/31/18, I got an email alert to the effect that a Portfolio123 member had commented as follows: “A new all time high! I couldn’t find any other Designer Models that are at a new all time high.” I clicked on the email and, much to my surprise, he attached the comment to this model, this former dud. I checked again on Folio and saw the same thing. I know better than to take a bow for its recent relative strength; I never do that knowing there’s always tomorrow. So I can’t say whether the strategy will retain its winning ways into the future from here on out. I’ll just stick with my original thoughts upon launch and on my quick double check. I continue to like the strategy and believe it will work well over time, even if that time is not the next few months. Again, scorecards and the like are for the Morningstars and William Baldwins of the world. I’ll stick with sound implementations of sensible financial theory — regardless of what happens to be in today’s box score. I’ve tried my best to offer logic and evidence in support of my contention that screen-based strategies can be attractive. But frankly, there’s only so much logic and evidence one can discuss before one’s brain starts to hurt. I think I’ve reached that point. 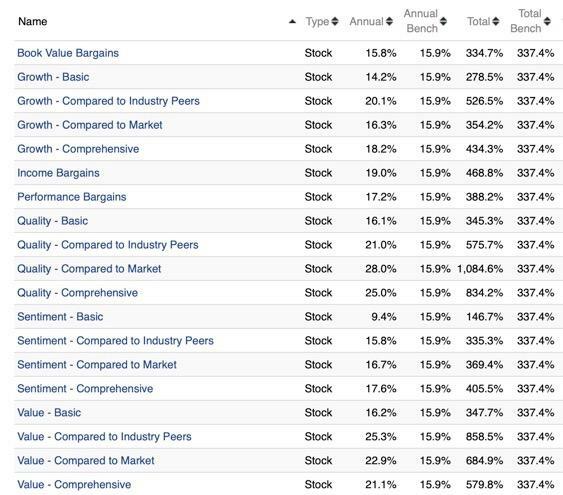 So before closing, I’ll share one more strategy-performance screen shot from my Folio Investing account. This is a collection of oddball-theme ETFs in which I invested. What, you might well ask was the logic behind my choices? Don’t ask. There is no logic, except that I thought they seemed cool. As can be seen, I’ve been beating the S&P 500 for a long time. But I make no claim to having been gifted with unique genius. I’m just a guy, and by no means the only one, doing my thing with tools at my disposal that were unimaginable to past generations of stock market investors. Am I an aberration, whether or not I want to believe it? I don’t think so. But one who wants to try to prove I am a special genius and that few can match my abilities (and hopefully do so without billing me for PR services rendered) should be aware of the massive task they’d be undertaking. The reams of studies purporting to document the failure of active management (the sort of evidence on which my PR heroes would be tempted to rely) have nothing to do with screening or with what many quants nowadays do. They are old studies that explored the efficacy of seat-of-the-pants stock selection or supposedly systematic approaches done before personal computing, screening databases, and usable platforms became available. I’ve gone so far as to argue that the dichotomy between active and passive investing is obsolete because it fails to address objective, systemic screening-based and screen-like strategies. I had proposed that this third approach, which sits between passive indexing and traditional active (subjective) investing be thought of as something like “Moneyball” investing (data driven decision-making in what was traditionally a subjective field like what author Michael Lewis described in his book about baseball). But the active-versus-passive dichotomy continues to be the rhetorical norm. That being the case, critics of non-index approaches now need to be extra careful about what, exactly, it is they bash, dig harder than in the past to try to get things right, and open their minds to new answers that might come from a proper research effort. Opponents who continue to insist that the S&P 500 cannot consistently be beaten and that my track record suggests special superior intellect rather than professional use of contemporary resources will find that eventually, I’ll tire of debating and just give in. Disclosure: I am/we are long PHO, IZRL, ARKK, PIO, ACSI, SLIM, AIEQ, CLIX, LOUP, LDW, OLD, BATT. I wrote this article myself, and it expresses my own opinions. I am not receiving compensation for it. I have no business relationship with any company whose stock is mentioned in this article.